The 2008 Mw 7.9 Wenchuan earthquake generated a tremendous number of coseismic landslides and induced dynamic crack propagation in the bedrock of slopes. These processes produced loose material that could be entrained in subsequent landslides potentially triggered by prevailing valley wind in the earthquake-affected area. However, almost nothing is currently known about the influence of wind in triggering rockfall hazard. 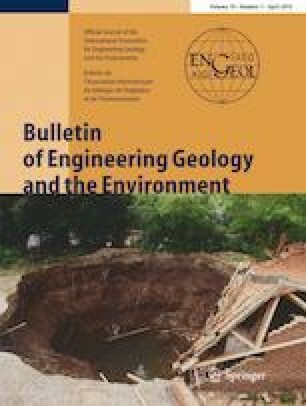 Therefore, we provide insights into the failure process and mechanics of wind-induced rockfall hazard by means of wind tunnel tests using different rock geometries. First, a 1:1-scale failure process simulation is used to model the aerodynamic instability of different geometries of rock blocks, and results reveal that (i) cubic rocks fail via downwind sliding; (ii) cuboid rocks fail via tailwind toppling or crosswind toppling (the latter only occurs when the unstable rock mass is close to the neighboring wall); and (iii) ellipsoid rocks fail via headwind clockwise rolling. The critical wind speed is inversely proportional to the angle of attack, the aspect ratio, and the ellipticity ratio. Second, a mechanical analysis is performed in terms of aerodynamic coefficients based on 6:1- and 4:1-scale wind pressure measurements, which is beneficial for studying the crucial factors involved in the occurrence of different failure modes. In addition, fast and effective methods to estimate the critical wind speed for sliding and tailwind toppling are developed, respectively. We are grateful to Dr. Martin G. Culshaw for his helpful suggestions and meticulous editing, as well as three anonymous reviewers for their critical questions and constructive comments, which helped to improve the draft manuscript. We also thank American Journal Experts for correcting the English of this manuscript. This research was supported by the National Science Foundation of China (No. 41572302) and the Science Fund for Creative Research Groups (No. 41521002).